Just west of Padstow, overlooking the village of Trevone. 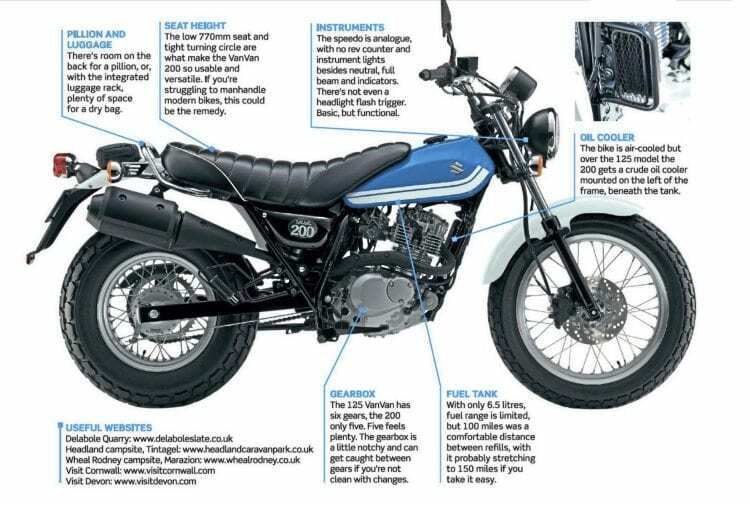 Suzuki’s VanVan 125 has been on sale in the UK for over a decade now. In that time it’s proven a popular bike among learner riders and urban commuters happy to live with the 12bhp engine, and won over by the retro styling, low seat height, manageable weight and cheap running costs. 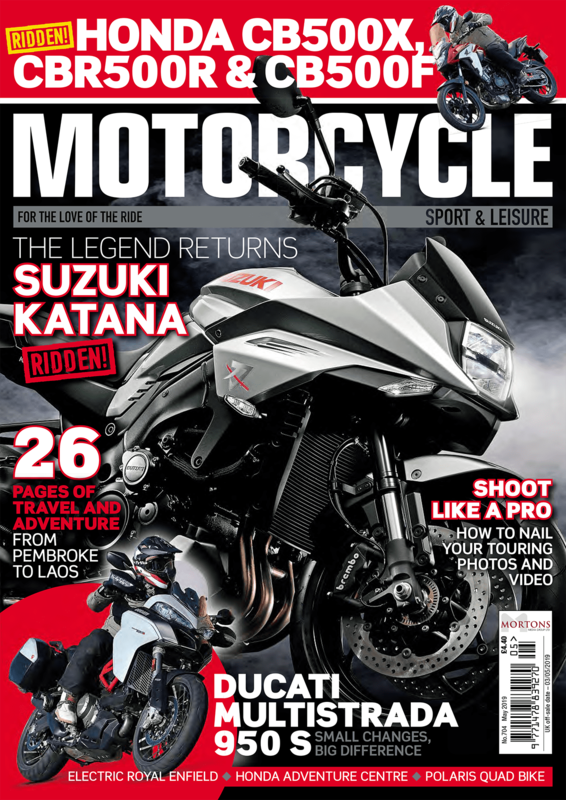 Suzuki now brings the UK its 200cc version, which has been available in other markets for a while now. It’s a strange decision in a way, given that for 2017 and 2018 the bike will receive a concession from Euro 4 legislation that will ignore the fact that it doesn’t have ABS. But for 2019 the exemption won’t apply so its time with us could be short. It’s largely the same bike as the 125; the same fuel-injected engine; bored and stroked to give the extra capacity, equating to a modest power gain taking it to 16bhp. The chassis, suspension and brakes — drum at the rear — remain exactly the same, as does the 6.5 litre fuel tank and oversized sand tyres. The only visual difference is the oil cooler bolted to the side of the frame, just beneath the left of the tank, though the bike remains air-cooled. Simple instruments give readings only for speed, full beam and neutral. Clearly, this isn’t going to be for everyone, but with that extra power it makes you wonder if in this congested Britain, it’s actually all the bike many of us need. Usable. Simple. Efficient. And at £3799 (£600 more than the 125), it’s relatively affordable, either as a second bike when you can’t be bothered to get the big one out of the garage, or as a primary bike that could commute, scratch, and even explore on. 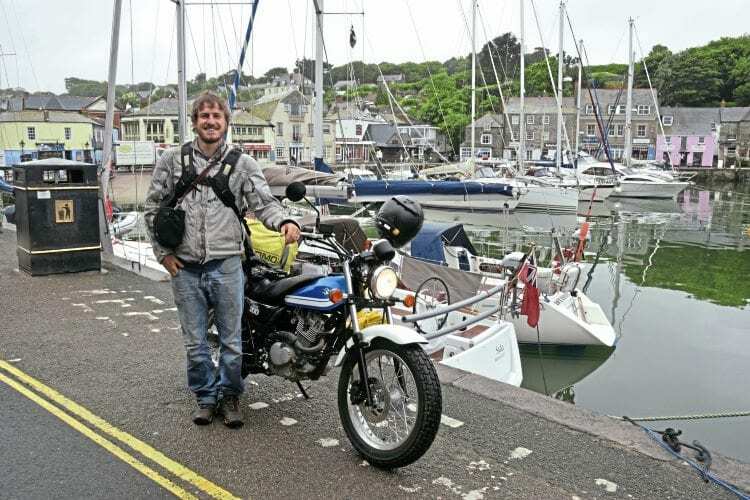 Having ridden around the world on a 105cc Australian Honda postie bike, it’s exploration that drew me to the VanVan 200 as a potential travel bike. After all, when you’re out there on your own, not in any hurry, then those virtues of usability, simplicity and efficiency are all you actually need. You don’t need power. 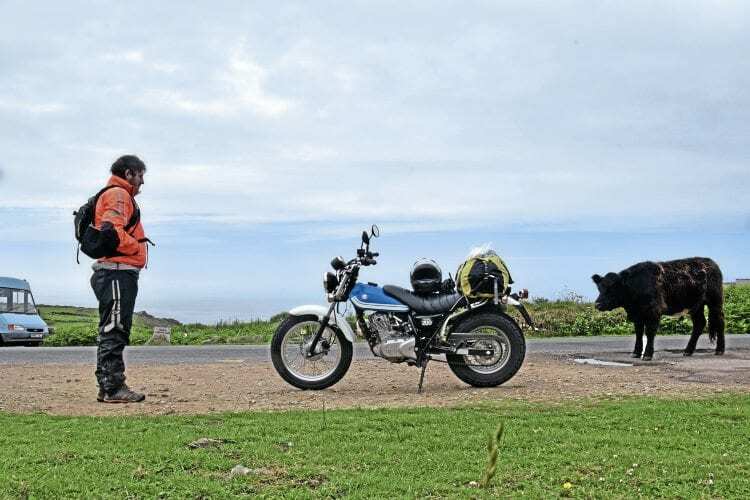 You don’t need technology and often the best adventure bikes are those you can afford to throw down the road or abandon at a border if the very worst happens. 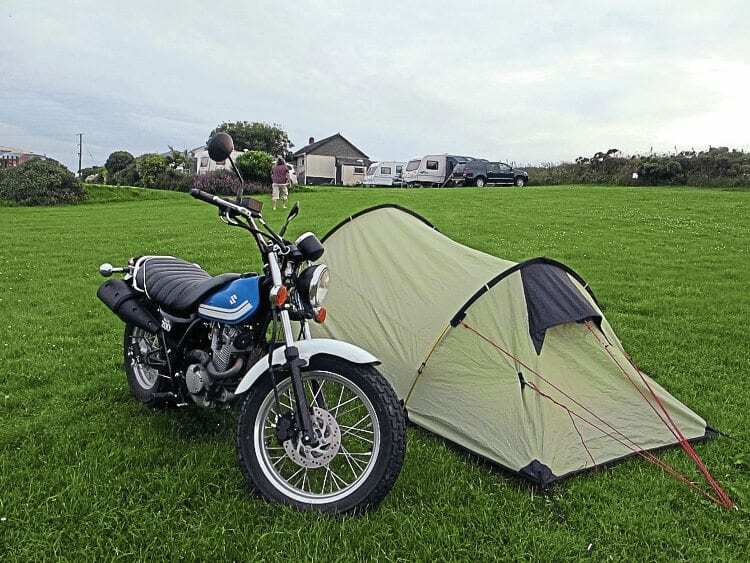 The plan was to take it on a three day trip along the north coast of Devon and Cornwall, leaving from my Warwickshire home on the Tuesday, riding down as far as I could that day, camping by night, and exploring the coastal roads the next day, before heading home on the Thursday. The trip would be done on a tight budget of around £100, with camping favoured for its cost and flexibility. With hotels and even hostels you’re always advised to book ahead, if only to get a good price. With camping you can wing it and just find somewhere to camp once you’re down there. 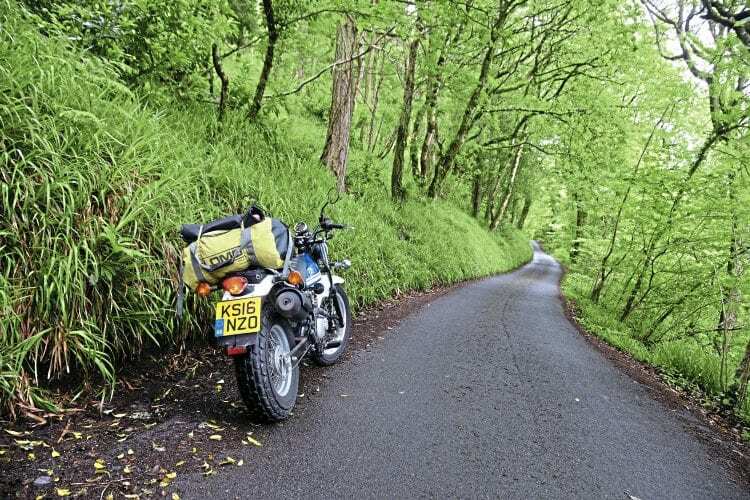 The reason for choosing Devon and Cornwall is that I find them commonly ignored as riding destinations, possibly because they don’t fit the scale of the oversized adventure bikes we’re increasingly riding and buying. So for a test of the VanVan, it seemed perfect. Having jumped on the MS at Tewkesbury I rode south as far as junction 23, surprised by the VanVan’s ability to keep up with traffic on the two inside lanes, with enough in reserve to do battle in the outside lane at an indicated 75mph. Clearly it’s not a quick bike, but the difference between this and the 125cc is significant — especially mid-range punch — and before I knew it I was cresting the Avonmouth bridge beside Bristol, and soon making the turn for Bridgewater. All I carried was camping gear in a dry bag on the back, a change of clothes and a camera. The A39 runs west from Bridgewater to Barnstaple, passing through Minehead, Porlock and Lynton along the way. 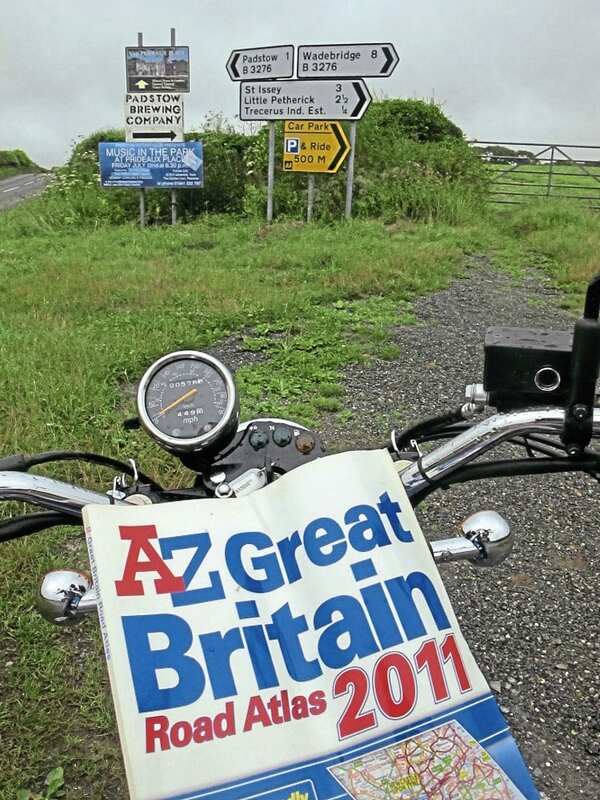 If you’ve never ridden it then you really must, as it offers one of the prettiest stretches of road in the UK. The rolling moors of Exmoor extend to your left, the waves of the Bristol Channel sit at the foot of high cliff-tops to your right. The road is undulating, steep at times, and the level of serenity having left the M5 behind is quite intense. I met a couple in a car park overlooking the sea. 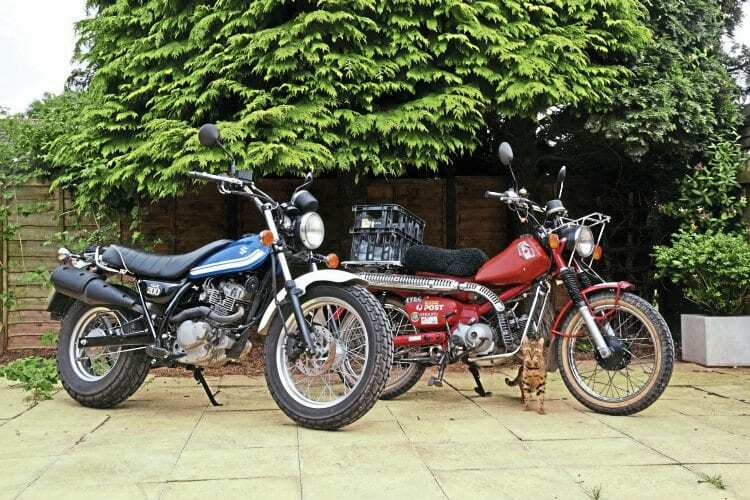 The man was immediately drawn to the Suzuki, explaining how he had been looking at the 125 model as a second bike to his Triumph Explorer, but in the end bought a Honda CRF250L for the extra power. Now that there’s a 200cc model, he conceded, he might have to look again. And that’s probably going to be this bike’s biggest market. The road twists and turns before descending into the pretty fishing port of Lynton, a haven for tourists and it’s easy to see why. The world is different down here — calmer, greener, prettier — I was beginning to feel that familiar sense of adventure, of being a long way from home. Navigating the old fashioned way. I’d not planned a route for the trip, just done some Googling the night before to dig out some points of interest. I didn’t carry a GPS, instead relying on a rolled-up RAC map. For me, the benefits of a paper map are that you actually get a feel for where you’ve been and where you’re going. It’s a more immersive experience. You have to stop and ask for directions. Talk to people. Get lost. Explore and rely on your own intuition, rather than blindly following arrows on the tank. Rather than continue along the A39 towards Woolacombe, I turned off into the Lynmouth, overlooking Lynton from the clifftop above. Ride through the village and you’ll come out at Valley of the Rocks and Lee Abbey just beyond. The former is a great little cove to explore, while passing through the Lee Abbey gates, dropping £2 into a donation box, reveals a lattice of tight, claustrophobic lanes, at times shaded by a thick canopy of trees that almost feels like jungle. Martinhoe is a lovely little hamlet to check out and gives you somewhere to head towards. Discovering the back roads behind Lynton and the Valley of the Rocks. The Van Van’s biggest surprise along these lanes is the way that it rides. Supple on the motorway, yet still sharp enough to make for a lot of fun on the back roads. Non-adjustable front and rear suspension deals with mid-corner lumps and bumps well, and despite cartoon looks, the fat tyres don’t impede or terrify you at point of entry, offering plenty of grip — wet or dry — while the wide handlebars make tight turns a breeze. Even 16bhp feels plenty powerful along these lanes; fast even, and with such light and low mass, spinning it around on the spot if you take the wrong turn is a doddle. The only criticism is a slightly notchy gearbox and the absence of a high-beam flasher, sorely missed along these narrow lanes when needing to let oncoming cars through. I pulled into the wonderful seaside town of Woolacombe for lunch; six hours on the road and just a tenner’s worth of unleaded used. Despite the tiny tank, the bike easily manages a 100 mile range between fill-ups, and would probably give closer to 150 at a push. In Woolacombe I found free motorcycle parking at the entrance to the car park opposite the Red Barn pub on the corner. A Cornish pasty for lunch set the tone for the rest of the trip — cheap and easy – before strolling down to the award-winning beach, where, during the Second World War, American troops carried out their training in preparation for D-Day; the beach of Woolacombe deemed suitably similar to those anticipated in Normandy. Barnstaple followed Woolacombe; one of the oldest boroughs in the United Kingdom. As far back as the 14th century it was licensed to export wool, with shipbuilding, foundries and saw mills the major industries that followed. Those have all long since closed, with survival, like much of the South West, dependent on a mixture of retail and tourism. Having crossed the border into Cornwall, the picturesque town of Bude is worth a quick look, though Widemouth Bay just a few miles beyond is a wonderful place for a picnic. Smugglers once came ashore in Widemouth, with it declared in 1357 that “any man or vessel that dared cross the great Widemouth sound were at once at the Cornish pirates mercy”. I love the mythology of this part of the world. Everywhere you look there is a story to tell. 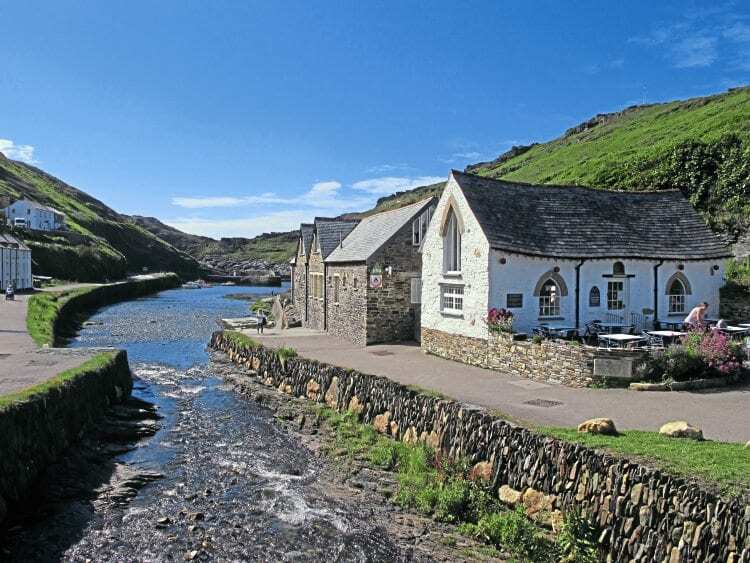 Boscastle, Cornwall, where floods struck in 2004. For another taste of the back lanes, just out of Widemouth Bay take the right turn by Widemouth Manor that sits proudly on the corner, watching out for the sharp left-hand corner that can catch you by surprise. This scenic back road takes you along another wonderfully steep and narrow coastal lane, passing through the communities of Dizzard and St Gennys, before emerging a little later just a few miles east of Boscastle. It was here in 2004 (the same year the 125cc VanVan was introduced into the UK) that severe flooding hit the small coastal community, sweeping 60 cars out into the ocean and wreaking havoc with the houses and people who lived there. Another mini-flood struck in 2007, but today you’d hardly be able to tell, such is the re-emergence of the place. Spend a few minutes wandering about the rebuilt Tourist Information centre by the river – the images they have on display serve as a reminder of just what a miracle it was that no one died that day. Camping in Tintagel, costing £10 per night. That evening I made camp in Tintagel, paying £10.50 for a tent pitch without power point at the Headland Caravan and Camping Park. Following a noodle supper I wandered down the path leading to the remains of King Arthur’s castle. The bridge to the island housing the main ruins was dosed for the evening, but you can still wander around the ruins on the headland for free. After 12 hours on the road it was a perfect place to end the day; with a spectacular sunset, crashing waves, circling gulls, and the feeling of being in a place with so much history and atmosphere. Even on a VanVan you can experience so much in a day. I woke that morning with the intention of stopping for a quick look around Delabole quarry, just to the south-west of Tintagel, as I’d read they gave free tours. Despite it being one of the deepest open quarries in the world – until the recent mega-quarries of America and Australia took the crown – I couldn’t find it for toffee. I wondered how it could be so difficult to find such a giant hole, realising it was probably just over the other side of the hedge I was riding back and forth along. I never did find it, so to avoid your own disappointment, visit www.delaboleslate.co.uk and organise a tour in advance. Breakfast in Padstow at the start of day two. Padstow was a pleasant surprise, as I stopped in this beautiful port town for another Cornish pasty breakfast. Out of Padstow I turned right off the main B3276 and headed down one of the narrow lanes leading to the coastal communities of Trevone, Harlyn and then to Constantine Bay. These are all idyllic Cornish villages, well off the main route but with some of the finest unspoilt coastal views I’d seen. 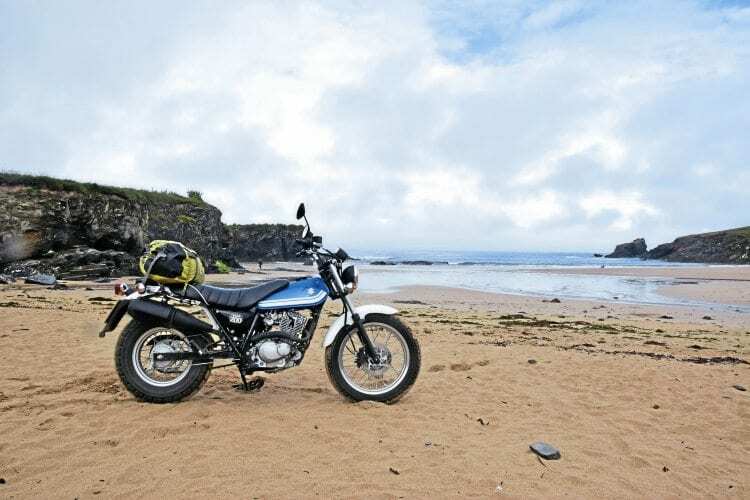 I rode onto the deserted beach at Trevone for a photograph, where the VanVan came into its own with its sand-bike tyres. 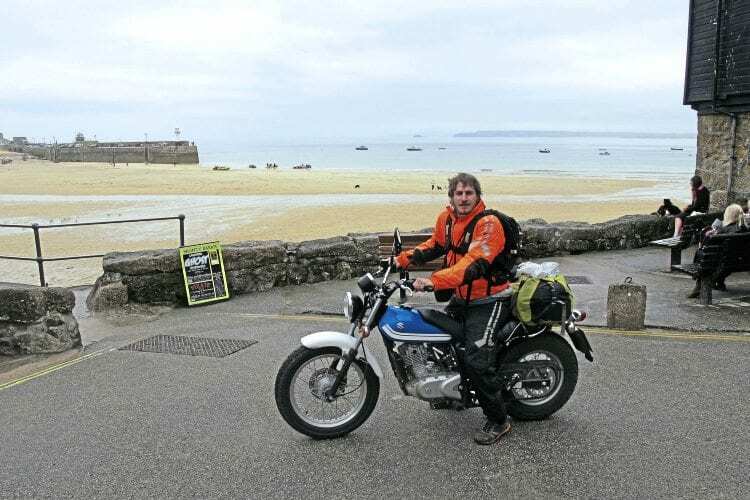 If I had more time it’d be great to explore the trails of Dartmoor and Exmoor, with the Trail Riders Federation able to help with the mapping – the VanVan would certainly cope with rough terrain. People I know have ridden them as far afield as Mongolia; the only problem with the VanVan as a travel bike being the odd tyre sizes that could prove difficult to get hold of a long way from home. Though apparently the tyres are good for at least 8000 miles. Riding the sand on the beach of Trevone. Newquay broke up the day — I’d not visited the popular town for almost 25 years. I gathered it had become quite a Mecca for stag and hen parties during that time, and I didn’t linger long, stopping on the way out to investigate Huer’s Hut, a white cylindrical building overlooking the town’s bay. A structure has been here, in one form or another, since the 14th century, with it used as a lookout for shoals of passing pilchard. The Huer’s Hut in Newquay, once a lookout for shoals of pilchards. Perranporth, a little further along, impressed, while St Agnes beyond that was interesting due to the tin mining that once went on there. Old shaft buildings dot the coastline, standing like ghosts of the past. Wheal Coates is one of the most well-known and well preserved mine sites in the area, dating back as far as 1692. Having swept through St Ives, nonplussed by the throng of tourist day-trippers, I took the lovely sweeping road in the direction of Land’s End. Wild cattle roam this road in packs, and more old ruins litter the roadside. On the road from St Ives to Land’s End. I’d been told I must stop at Cape Cornwall on my way to Land’s End and I’m glad I did as it’s a wonderful spot; largely unspoilt, a simple grass car park, the attendant waving me through without having to pay, and best of all, tea is served in a porcelain cup. It was probably my favourite spot of the trip, sitting on the grass, looking out at the sea. Land’s End was the opposite, a tourist trap if ever there was one; paying to get in, paying to park, paying to have your photo taken with the sign. 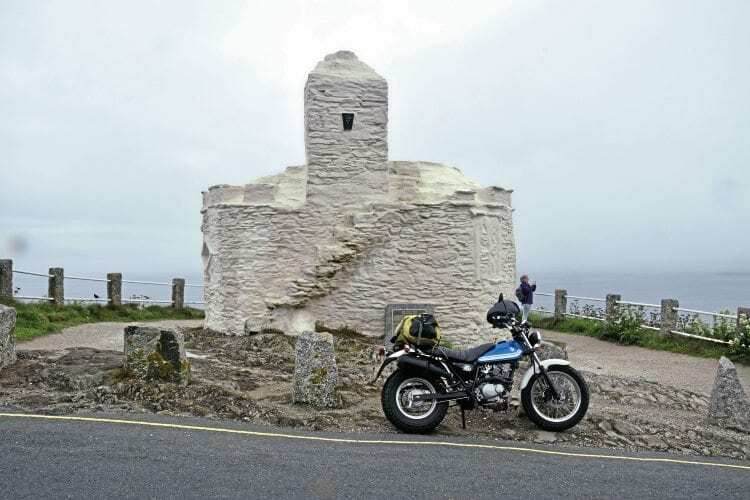 I met a Dutchman travelling the UK on a Yamaha VMAX, planning on being at the top of Scotland in a matter of days. He was probably my highlight of Land’s End. Looking out across Penzance harbour to St Michael’s Mount. By that time it was getting late, but still wanting to cover a few miles I headed in the direction of Marazion, the town overlooking St Michael’s Mount, and set up camp nearby. That evening I rode back to the harbour to watch the sun set over the tidal island on which, against all odds, a castle and chapel has been built. It was a beautiful view. One of the best. And to think that so far I’d spent around £20 on fuel, the same on camping and about £30 on food and drink; adventure had never come so cheap. A welcome can of Tetley’s Smoothflow greeted me back at the tent. 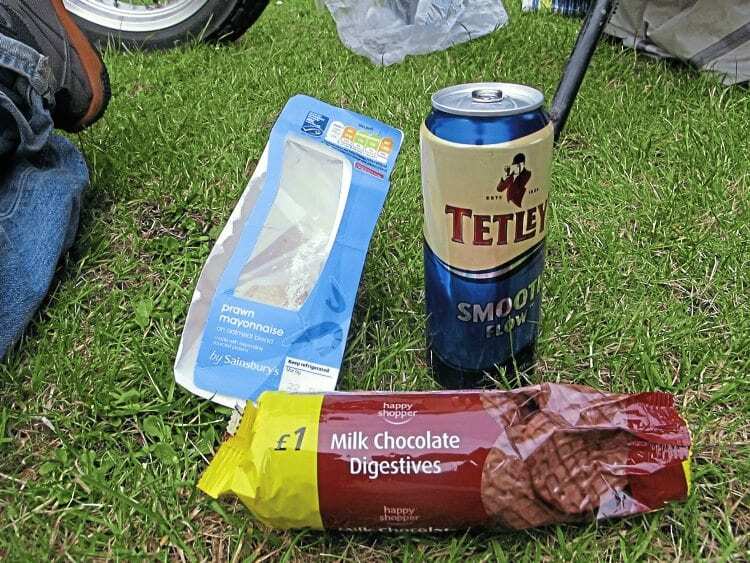 Budget supper on the campsite in Marazion. After another early start I headed down the tip of the Lizard Peninsula, the most southerly point of the UK. To get there you pass RNAS Culdrose, Europe’s largest helicopter base and home to Merlin Squadrons embarked upon Royal Navy warships. The Lizard beyond that is a flat and fairly featureless peninsula, the road running about 12 miles from Helston before you get to the end. Here you find a spectacular lighthouse with a youth hostel built beside it, which in terms of views must be one of the finest. Raincoats needed on the passage through St Ives. From here I calculated that it was about 270 miles back home to Warwickshire. The route would be east along the A30, until finally joining the M5 at Exeter and heading north. Had I had another day, I would have taken in the southern coastline as well, passing through places such as Falmouth, St Mawes and Portmellon. I’ve learnt over the years that there’s never enough time to see all the places you want, so best not beat yourself up about it. The VanVan 200 cruised back up the M5 with no problems. 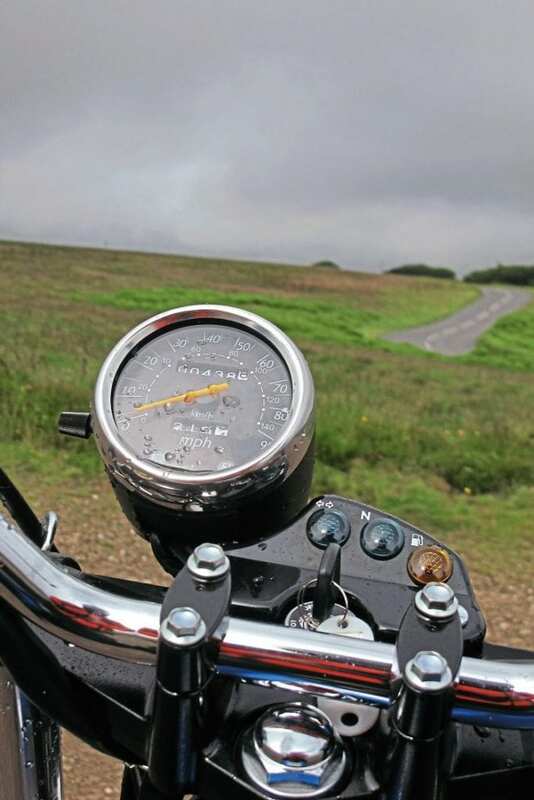 It sat at an easy 65-70mph all the way, remaining comfortable and within its limits, and once you get into the rhythm I generally find that riding a small bike a relatively long distance has the potential to be a more relaxing experience than a bigger machine. The relative lack of power takes the heat out of the ride, because your speed is dictated by the bike, and not your own levels of restraint. By the time I made it home I’d covered just over 700 miles in two and a half days, and came away really impressed by the VanVan 200. It has the benefits of a small bike in that it is light, manageable, and frugal, but it also proved itself capable of sitting on the motorway and never feeling like it needed more power. 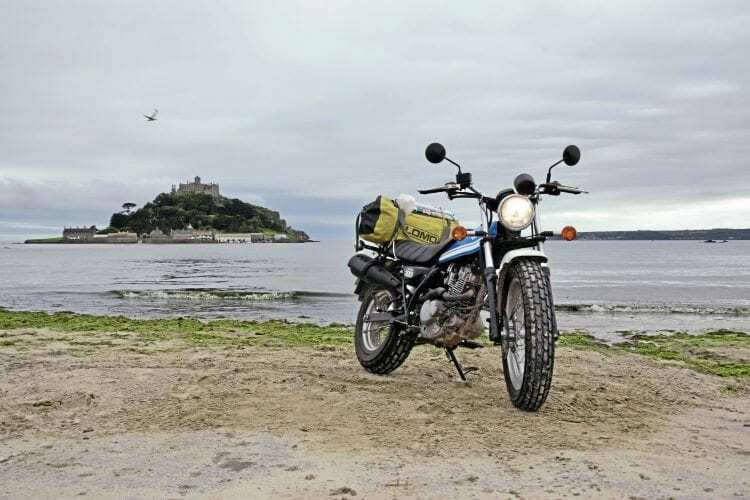 It was also perfectly suited to a trip around Devon and Cornwall, in a way that a fully loaded large-capacity adventure machine might not be. It allowed me to explore and get lost, without having to worry about the weight or the damage I might do if I’d dropped it. Buy it as a second bike, but you might just end up using it as your main. This obviously depends on the time of year and the weather. Managing without bulky side panniers would be a benefit as some of the lanes are tight and they could restrict where you get to. Travel as light as you can. Book hotels, hostels or B&Bs to remove the need to carry bulky camping gear, though camping can be a highlight down here. 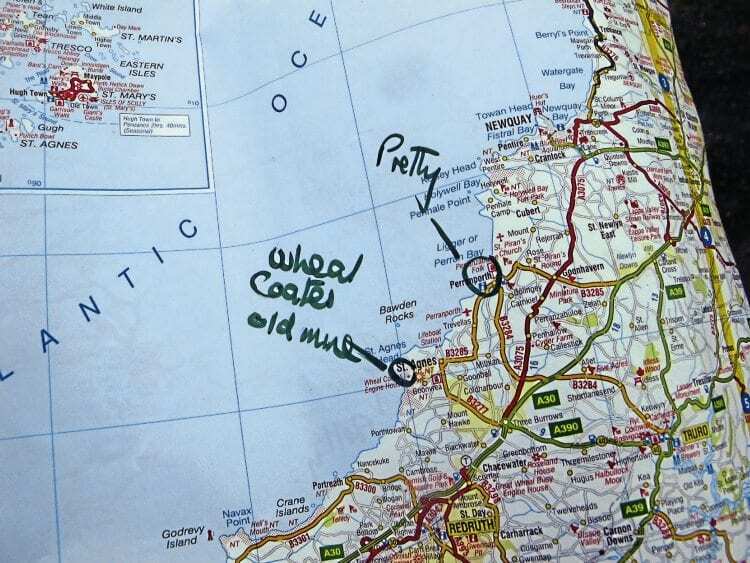 A paper map is handy, regardless of whether or not you have GPS. Reception isn’t always great if you’re using a phone, and a paper map is useful in helping identify alternative routes and hidden lanes. Take basic tools to patch up punctures, as the chances of picking up a thorn could be high along some of the lanes. Sunglasses and sun cream are a must in summer. A long distance travel bike? 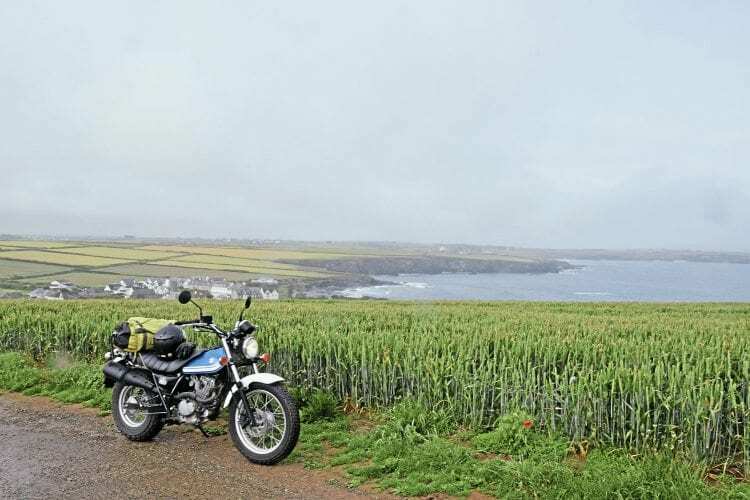 Back in issue 670 I spoke to Weronika Kwapisz, who rode her VanVan 125 around Europe, but what of taking the new 200 model even further? Comparing it to my 105cc postie bike it’s clear to see there’s not a great deal separating them in terms of size and weight. This is a good thing as I always thought that if you could get something like a C90-sized scooter that could cruise at 60mph in comfort then it’d be the perfect long-distance solo adventure bike. Like the old Honda, the VanVan feels durable, easy to manoeuvre and cheap to buy, run and get the documents for. The only limitation, as previously mentioned, is the tyre sizes, which could be difficult to get in faraway places, but so are tyres for a lot of other bikes that people go around the world on. Alternatively, use the bike to discover the adventures you could be having in your own back yard. Previous Post:Ride. Eat. Camp. Repeat.